Back during Halloween, Gia*da De Laurentiis did a show making candy. Rori asked me to record it and has watched it at least 15 times. Giada made Turtles, Truffle Pops and Homemade Marshmallows. Rori had been begging to make them so finally I caved. We skipped the turtles because 3 things was too overwhelming. We started with the Marshmallows. Rori let me know that it didn't take Giada nearly as long to cook the sugar mixture as it did us. I tried to explain the movie magic to her, but I don't think she understood. Unfortunately I didn't get a picture of the marshmallows, so I'm stealing the one my mom had of them in her hot chocolate. Aren't they lovely? Liam and Rori did the sprinkles. Next we made the Truffle Pops. 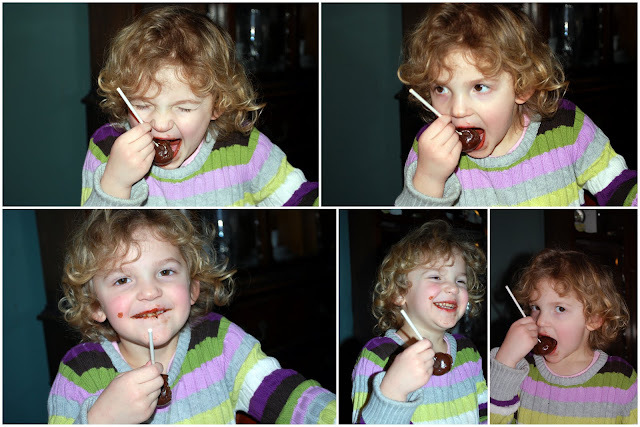 Those were truffles on a lollipop stick. We made the ganache and Giada said to put cinnamon in it. I wasn't going to, but since Rori had seen it so many times, she didn't forget. She said, "Mama, we're supposed to put cinnamon in because it warms it up and gives it a little kick!" So we did. And she was right :) Then we put the sticks in and dipped them in the chocolate. Then I took a bite...they were heavenly...and I had to get them out of the house lest I eat them all and undo the work I've been doing with Jillian! Do you think Rori liked them? I am loving doing this with her. I am so glad she is enjoying cooking and baking--although it's going to be trouble for my saddlebags!